Here it is! My very first completed adult sized jumper! Sure it’s a cardigan. Sure it’s still got to have its ends sewn in and buttons sewn on and be blocked. But still! Finished!!! I cast this on as my Olympic Knitting project way back in was it July? And for me, this is pretty focussed effort, really. Finished in the same year I started! Obviously not worked on continuously ahem. But yeah, it’s got me excited about the potential of knitting more large garments ie other than socks. So, this is a pretty happy tick in my knitting bucket list book – first sweater knitted. I also knitting I-cord for the first time. And button holes. And struggled with the cast on which drove me crazy! It was knit top down all in one piece and then the arms knit in the round, casting on to stitches that had been placed on hold. Pretty fun! 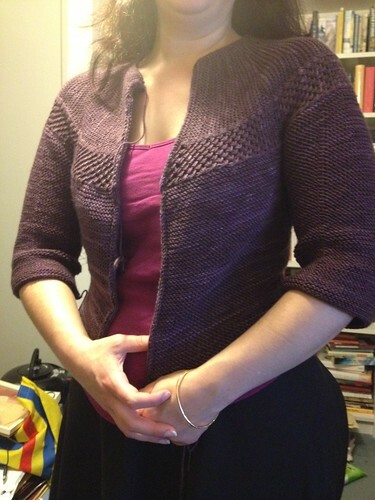 So details – Ravi Cardigan by Carol Feller in Aubergenius colourway, Socks that Rock by Blue Moon Fiber Arts.